SKOWHEGAN — A winged ally of Maine farmers is the focus of a new partnership between the Somerset County Soil & Water Conservation District and the Damariscotta River Association. A $5,000 grant from the 2018 Cornell Land Trust Small Grants Program will support the Ag Allies program, a project to educate Maine citizens and work with local farmers and land trusts to provide much-needed safe nesting habitat for steeply declining populations of grassland bird species. Male bobolinks (Dolichonyx oryzivorus), black and white and often perched in a hedgerow or on a clump of grass, are an iconic spring sight in Maine hayfields. 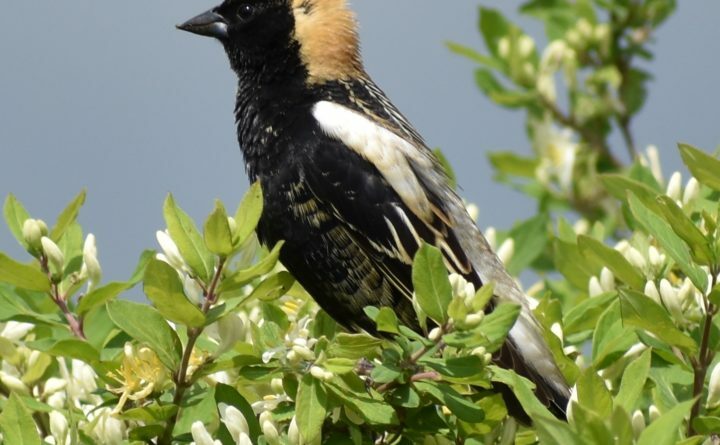 In addition to being a delight to see and hear, bobolinks and other grassland birds are true agricultural allies to Maine farmers, as these birds consume large quantities of both insect and weed pests each growing season. Unfortunately, these and other grassland birds are declining faster than most other groups of birds due to habitat loss. Ag Allies was launched by the Somerset County SWCD in 2017 under the leadership of the District’s Technical Director Laura Suomi-Lecker to provide education and support for agricultural landowners wanting to help grassland birds. Bobolinks, meadowlarks and sparrow species require undisturbed hayfields for nesting. Delaying the onset of mowing until after birds have fledged is critical for survival. “Ag Allies helps farmers make room for critical conservation on working ag lands in ways that accommodate individual farms’ management needs,” says Suomi-Lecker. In its pilot year, the program resulted in delayed mowing on more than 400 acres of confirmed bobolink breeding habitat, allowing an estimated 1,000 nestlings to be successfully fledged from these fields. The Damariscotta River Association (DRA) joined the effort in 2018 to assist with landowner outreach, especially within the Maine land trust community. The DRA manages 60 acres of hayland for grassland birds within its conservation holdings. Grant funds will allow Ag Allies to engage with more landowners and have a greater impact on grassland bird conservation. The Cornell Land Trust Small Grant Program is part of an initiative launched by the Cornell Lab of Ornithology and the national Land Trust Alliance to help protect birds on private lands. The goal of the new Land Trust Bird Conservation Initiative and associated web site (birdtrust.org) is to improve conservation for declining species by pairing the bird conservation community with land trusts, which collectively protect more than 24 million acres of private land nationwide. For more information about Ag Allies, contact Laura Suomi-Lecker at laura.lecker@me.nacdnet.net, 207-474-8323 ext. 3 or Jesse Ferreira at jferreira@damariscottariver.org, 207-563-1393. Based in Skowhegan, the Somerset County Soil & Water Conservation District is one of 16 districts in Maine that help people conserve and improve their land. The District has a mission to preserve and improve soil and water quality through education and implementation of conservation practices. Programs include Ag Allies, the Yankee Woodlot demonstration forest and landowner education. The District office is located Somerset County USDA Service Center, 70 East Madison Rd., Skowhegan. For more information phone 207- 474-8323 or somersetswcd.outreach@gmail.com. A non-profit, membership supported, and nationally accredited land trust and conservation organization, Damariscotta River Association is dedicated to preserving and promoting the natural, cultural, and historical heritage of the Damariscotta region, centered on the Damariscotta River. DRA has active programs in the areas of land conservation, stewardship, community education, water quality monitoring, marine conservation and cultural preservation. Visitors are welcome at the Great Salt Bay Heritage Center in Damariscotta as well as the many other DRA properties throughout the region. For more information call (207) 563-1393, email dra@damariscottariver.org, or visit online at www.damariscottariver.org.